Far away from the stereotypical image of Mauritius, notably the white sandy beaches with turquoise blue waters and casuarinas trees, the paradise island is much more than its usual typical image. The volcanic island is a paradise haven of panoramic landscapes, lush forests, mountains, roaring waterfalls, plunging cliffs and bottomless gorges. There are several spectacular waterfalls in Mauritius, and each of them are equally beautiful than the other. Blessed with luxuriant vegetation and fertile soils, the waterfalls in Mauritius are sanctuaries of relaxation and a way to connect with nature. Most of the waterfalls are found in isolated and serene places, and paths to reach them can be quite challenging. Yet, it is worth the effort to discover the rustic, wild and yet spectacular side of Mauritius. Tread lightly, breathe the fresh air and surrender yourself in the midst of luxuriant reserves with no one around to bother you- a green vacation submerged with enthralling waterfalls, and winding rivers. 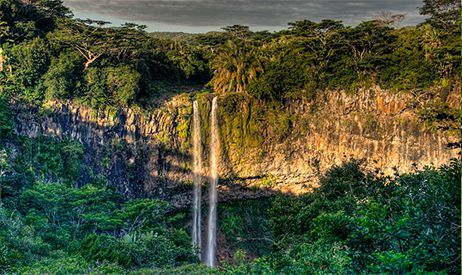 Taken from its location name, the Chamarel Waterfalls are listed among the top attractions in Mauritius. The first settler in the area was captain Antoine Régis Chazal de Chamarel who settled here with his brother Tristan in 1786. Later they sold it – but the name remained and in turn the village was named Chamarel. Interestingly, Chamarel is a south-western historical village with great geological significance, consisting of scenic landscapes and natural attractions such as the Seven Coloured Earths, Black River Gorges National Park, including the magnificent Chamarel Waterfalls. Known as the highest waterfalls of Mauritius, the Chamarel Waterfalls has a height of about 100 meters (almost the same height as the Statue of Liberty) cascading down against a scenic backdrop of luxuriant forests and mountains which is simply breathtaking. The Saint Denis River flows through fields and gorges, seawards and makes for a splendid view. You can choose to see the waterfalls from the upper deck situated at the Chamarel Seven Colored Earth reserve or can head down the trail to enjoy shallow water swimming at the bottom of the Chamarel falls. Another example of the lush green Mauritius is the iconic Alexandra Falls. Located some 700 meters above the sea level, the incredible Alexandra Falls is found in the Black River Gorges National Park. The electrifying green of the region, the diverse luxuriant flora and fauna and the magnificent landscapes altogether make it a wonderful way to connect with nature. You can get access to the waterfalls by going to Plaine Champagne and heading towards Grand Bassin. All you need to do is to look out for the sign post of the Alexandra Falls Viewpoint, and once there, you will find a large parking area with refreshment sellers. There is nothing as soothing to the soul as witnessing the spectacular waterfalls cascading over the rocky outcrops which from afar looks like a silent white stream. Spend a tranquil moment in the surrounding virgin green valley which is home to some endemic avian species and flora. As a bonus, you will have the chance to find some really delicious ripe ‘goyave de chine’(Chinese Guava/ Strawberry Guava) at Plaine Champagne where you can easily spend some quality time away from the crowds, in the midst of nature. 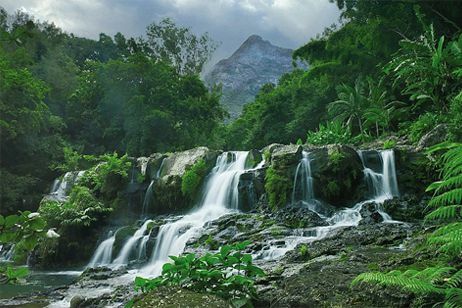 Located in the district of Black River, more precisely near the small village of Henrietta, the Tamarind Falls popularly known as the ‘Sept Cascades’ is one of the enthralling attractions to visit while holidaying in Mauritius. The Tamarind Falls is among one of the most verdant, serene, and adventure-packed destinations in the paradise island. The source of the waterfalls comes from the Tamarin River and has at least seven simultaneous splendid waterfalls. The area is filled with a bountiful range of exotic and indigenous plants, and some wonderful bird species. It is also one of the most beautiful canyons of the island that will suit any adventurer. Tamarind Falls offers many opportunities for adventurous activities such as hiking and canyoning. With each fall, you will have the chance to enjoy unique scenery and setting due to its height and flow of water. There are some challenging tracks which may require an experienced guide alongside to guarantee your safety and guide you through the best available paths. Passing behind the spectacular waterfall is simply a blissful experience, where you can see the sunlight reflected through the waterfall. The refreshing, large pond at the foot of the waterfall is very much accessible for a pleasant swim. You can also enjoy a natural massage standing under the cascade. Located within the vicinity of the colonial Eureka Mansion in Moka, the Eureka Falls is another highlight of the historical area. Besides, the elegant antiquity of the manor, and tropical garden with exotic flora, the Eureka waterfalls adds a magical touch to the whole experience. As you walk down the path, a little further away from the mansion, you will find yourself descending a rather challenging path which leads to the waterfalls. 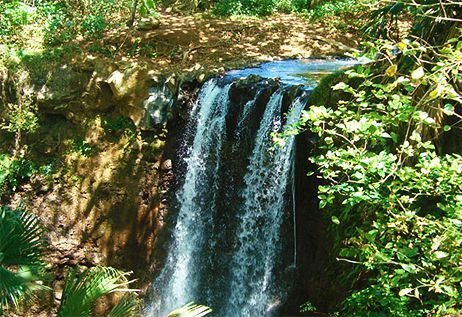 There are four gorgeous waterfalls set in a lush green area, where there are many palm and mango trees. Strolling deeper into the garden, one can find the azaleas and the camellias as well as the endemic ochna from South Africa. Upon reaching down you will find yourself in a peaceful environment vibrating with the rush of the waterfalls, and sounds of animals. Spend some quality moment at the waterfalls, you can also choose to take a refreshing bath. There are some aquatic plants such as water lilies, 'jacinte d'eau', and 'bredes songes' in the river banks. Under the water surface there is also an intense marine life including the 'scampi, madame Céré' (name derived from the wife of the governor Céré), tilapias, carp and eels which can be found in large quantities. The Grand River South East is another highly visited attraction in Mauritius. Situated in the South Eastern Coast of Mauritius, you will pass through meandering roads leading to coastal villages before you reach the waterfall. The visit of the waterfalls is usually combined with a trip to Ile aux Cerfs, another popular tourist attraction in Mauritius. On the way to the waterfalls, you will be surprised by the drastic change of the scenery. From turquoise-blue waters to greenish waters surrounded by a vast area of verdant trees. With a little luck you might spot the monkeys which live there. The huge wall of basalt rocks allow you to discern the formation of this area. As you reach the far corner, you will be mesmerized by the gushing waterfalls, which are simply spectacular. The departure point is generally at Trou D’eau Douce as it is the embarkation spot for many excursions leading to Ile aux Cerfs. You will most likely embark on a speedboat to discover the Grand River South East. 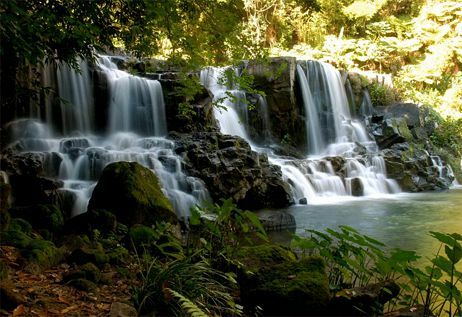 In the southernmost tip of Mauritius is a pristine green sanctuary where you will find the spectacular Exil Waterfalls. The waterfall is precisely located on the outskirts of the unspoilt Combo forest. Exil canyon sits on the Savanna River on the lands of the Exil lodges. The waterfall is surrounded by a tropical forest which inhabits many wild animals, some are native to the area, and some indigenous plant species. The Exil waterfalls offer a picturesque nature view which will soothes your mind and soul. Adventure lovers, this is the ideal place to try some thrilling activities such as abseiling, jumping, and swimming across the ponds. The canyon has a moderate level of water all year round that rapidly swells up during heavy rainfall, turning the river into a nice aquatic adventure. The canyon also consists of two main waterfalls, Leon, a 20 meter drop into a 25 meter wide pool and Cascade Cecile, a 45 meter drop. The river continues to the hydroelectric power station with several water pools and a few possible jumps. 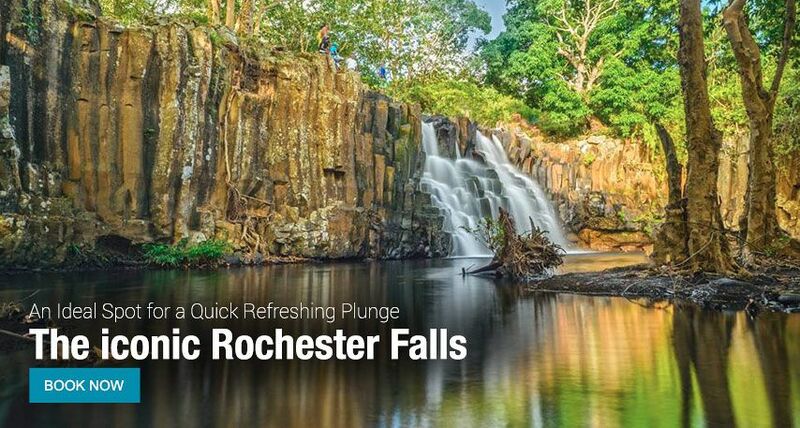 The iconic Rochester Falls is located in the Savanne district of Mauritius, just some 2.5 kilometers away from Souillac (South of Mauritius). It is also known as the widest waterfall in Mauritius. This majestic waterfalls is set in an isolated, wild and lush green area where you can find unique and dramatic cliff faces which have been transformed into jagged rectangular blocks by the force of powerful water over the past hundreds of years. The cascading waters tumble from a height of 10 meters through the rocky beds of the Savanne River and form a thick foam. Mesmerizing as it may seem, this spectacular spot serves as an ideal spot for a quick refreshing plunge or a small picnic break. The breathtaking scenery, cascading waterfalls, pools of clear water, and luxuriant greeneries surrounding the region, makes it a wonderful site to see and a relaxing experience. You might also meet some daring and adventurous locals who are willing to jump from high above the cliffs to the pool of water which can be fatal.